If the bewildering amount of recent Star Wars advertising, hype, and skepticism has you annoyed, you'd best not boot up Deus Ex. 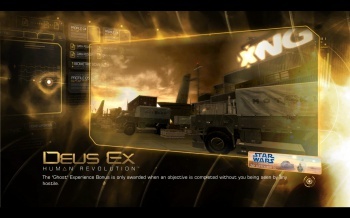 A recent patch for Deus Ex: Human Revolution inserts advertisements for the "updated" Star Wars blu-ray collection into the game. The game's loading screens, which are both frequent and long, have been shamelessly updated with a glaring banner for Lucas' latest alteration (to be diplomatic) to some of the greatest science-fiction films ever. The ads aren't even cleverly disguised into billboards or those crazy, futuristic screens that call you by name. They just sit there, standing out against the black and gold background. I don't have a problem with in-game advertising as long as it makes sense. In fact, I expect it in sports games and racers. But this?